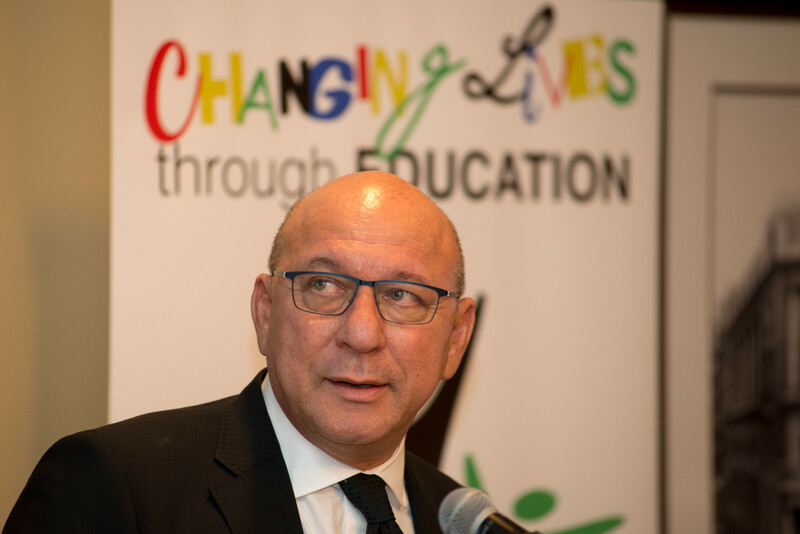 Trevor Manuel, Founder of the Mitchell’s Plain Bursary and Role Model Trust, urges university students to “grab opportunities with both hands” as they navigate the world outside of school. At a gathering of students who benefit from an education trust which he founded, Trevor Manuel is introduced to first-year students as “the world’s longest serving finance minister”. “Doesn’t mean a thing”, he responds from his seat in a hall at Kirstenbosch Botanical Gardens. This off-the-cuff retort pretty much sums up his relaxed demeanor, dressed in jeans and sneakers on a Saturday morning, waiting to speak to a group of students receiving financial aid from the Mitchell’s Plain Bursary and Role Model Trust. In spite of the many titles he holds, the Chairman of Old Mutual prefers to be referred to simply as “Trevor”. However, perhaps predictably, the young people gathered here insist on calling him “Uncle Trevor” or “Mr Manuel” though. Addressing about 60 bursary recipients, he talks about life skills and the gaps in education at Cape Flats schools which leave students ill-prepared for the demands of tertiary study. What the Trust and students are doing is “together, play catch up”, he says. This is echoed by Chad Hamner, a first-year education student at the University of the Western Cape. He passed matric at Cedar High School last year. Talking about the adjustment from high school to university, he says it’s not hard, “just different”. Saturday’s social gathering is the Trust’s gift to the students before they tackle their end-of-year exams. He tells the young people that they have to “learn from each other”, and looking to someone in the audience, interjects with a light-hearted “aweh, ma se kind”. The former finance minister’s command of Cape Flats slang, loosely translated as ‘greetings, my brother’, propels the room into hysterical laughter. Mr Manuel tells them of challenges across the world which has left young people worse off than their parents. “Part of what we aim to give you is not just an opportunity to get a degree from a tertiary institution, it’s also to help arm you with a set of life skills that you will be able to take and carry yourself,” he says. Asking that they “plough back into the community” Mr Manuel shares stories of his own upbringing, in Kensington, and the history of Mitchell’s Plain from the time “it was just bush and dune”. The bigger picture is clear in Manuel’s talk: motivate young people who are preparing for life beyond the townships and instil in them a sense of responsibility to help others navigate the road to success. Much has changed since the early days of the Trust which Mr. Manuel helped establish in 2010 whilst deployed to Mitchell’s Plain as a Member of Parliament for the governing African National Congress. This year the Trust sponsors 75 students at various tertiary institutions and although it is firmly rooted in Mitchell’s Plain, increasingly the Trust is supporting students from surrounding areas such as Philippi and Khayelitsha. Co-Chairman of the Trust, Jeremy Michaels, says the bursary programme will have disbursed an estimated R1.5-million by the end of the 2018 academic year but this only fulfils part of the Trust’s objectives. “The Trust is extremely proud of the fact that since inception we have assisted at least 25 students to graduate across a wide range of disciplines and that number will increase substantially going forward, noting that we are now providing varying degrees of support to no less than 75 students.” says Michaels. Having said that, the Trust had also been grappling with the changes in the State’s funding model for tertiary education, announced by former president Jacob Zuma on 16 December 2017. It is with this in mind that the Trust organised, for the first time in its eight-year history, a social outing with a difference. The trustees would learn along the way that paying fees is not where their involvement with the students ends. “If we thought fees are the only thing that students need to study….” Mr Manuel says. Keshia Urias, from Beacon Valley is a second-year biochemistry student at the University of Cape Town (UCT). It was in matric at Spine Road High that she learnt of the opportunity to get financial aid from the Trust. She jumped at the chance because being raised by a single parent would have made tertiary studies difficult. Keshia lives at a varsity residence, at her mom’s request because there would be no transport available after evening tests or studies. She also received aid from the National Student Financial Aid Scheme (NSFAS). But this is not enough to cover expenses which her single mom would not be able to cover. “There’s always that gap in funding. With the help of the Trust, I don’t have to worry about it,” she said. For many of the students, it was their first visit to Kirstenbosch. Reflecting on the country’s legacy, Mr Manuel told the group to plough back into the community. “Already other people are looking up to you,” he said. The students then headed out into Kirstenbosch Gardens for a modern-day scavenger hunt before boarding a ‘Red Bus’ for a trip to Hout Bay and along the scenic Atlantic Seaboard to learn more about Cape Town and its history. Karen Pretorius is a freelance journalist contracted by the Mitchell’s Plain Bursary and Role Model Trust. The Mitchell’s Plain Bursary and Role Model Trust (“the Trust) was established by Trevor Manuel in 2010 when, as a Member of Parliament, he was deployed by the African National Congress (ANC) to its Mitchell’s Plain Constituency Office. The Trust is a South African registered Public Benefit Organisation (PBO) in terms of both section 30 and 18A of the Income Tax Act. The Trust has, since its inception, assisted many young people from Mitchell’s Plain to study at universities, technikons and colleges. In 2015 alone, the Trust awarded more than R1-million in bursaries covering tuition and/or registration fees to 82 matriculants and current students. In the 2014 academic year, for the first time in Mitchell’s Plain’s 35-year history, Spine Road High School achieved a 100% matric pass rate and Glendale High School learner Jayson George matriculated with eight distinctions. This shows what is possible in spite of the considerable odds which learners from Mitchell’s Plain encounter on a daily basis, including gang wars, poverty and high crime levels in their communities.